As schools have adopted discipline policies that favor incarceration over education, children of color and children with disabilities are bearing the brunt of these policies at alarming rates, a trend that teachers can change, according to the new issue of Teaching Tolerance magazine, released today by the SPLC’s Teaching Tolerance project. The cover story of the Spring 2013 issue – “The School-to-Prison Pipeline” – examines these policies and how a teacher’s daily decisions can help prevent students from being pushed into the criminal justice system. It also offers several scenarios that show how a teacher can effectively respond to a discipline problem in class without it leading to a needless arrest. 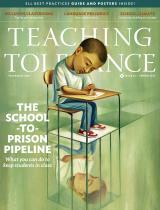 The Spring issue of Teaching Tolerance can be viewed here. A new digital edition of the magazine is also available. Though data show African-American students are 18 percent of the nation’s students, they account for 46 percent of students suspended more than once. One report found that while 8.6 percent of public school children have been identified as having disabilities that affect their ability to learn, these students make up 32 percent of youths in juvenile detention centers. Teaching Tolerance also examines how modern-day freedom schools are working to end this trend. “No School Like Freedom School” describes how these schools – modeled after the original 1964 Mississippi Freedom Schools founded to help communities develop leaders and exercise political power – are educating and empowering students today. Other articles examine the unintended consequences of school uniforms; challenging language prejudice in the classroom; and protecting the religious freedom of students participating in extracurricular athletic activities. Teaching Tolerance magazine, issued three times a year, is the nation’s leading journal serving educators on diversity issues. It is distributed free of charge to more than 450,000 educators nationwide.